Bad weather can wreak havoc on your travel plans. With headlines playing up planes stuck on tarmacs and newspapers printing images of exhausted people sleeping on airport floors, it’s hard to avoid total panic. But it doesn’t have to be that way when your flight is grounded. Here’s a primer on your rights and other important things you need to know when bad weather strikes. Airlines consider bad weather situations—including snow storms, hurricanes, fog conditions, and so on—to be “force majeure” events or “acts of God,” and are not the fault of the airlines. Therefore, when it comes to your rights when there’s a cancellation, the one basic thing you are entitled to is a refund—no free hotel stays, no ground transportation, and no food vouchers (though airlines might offer these options at its discretion). And there are other potential woes. Even with a flight refund, travelers may not be fully reimbursed in these situations since they might have missed a cruise departure or tour (which may or may not be fully refundable), or they might need to pay for extended hotel nights and other travel expenses out of pocket. Plus, travelers might have to wait quite a while, depending on the severity of the storm, before being able to return home or reach their intended destination. It can take several days for all passengers to be rerouted. And although airlines often add more air lift, it still takes time to relocate planes and flight crews. Airlines have learned from the past and now preemptively cancel flights before storms hit. In theory, with the advance warning, fewer passengers will find themselves stuck at the airport than in the past. Though it might seem counterintuitive, you’ll have better access to resources in the comfort of your home or hotel room than at the airport. Also, airlines have historically waived change fees so that customers can rebook without penalty. Normally, you would have to pay a hefty fee (up to $150 for domestic and $250 for international flights) to alter your ticket. However, date restrictions will often apply, and every airline’s waiver policy is slightly different in each circumstance. Reconfirm Your Flight: Just because skies are clear at your departure airport doesn’t mean your flight will be spared from cancellation. Because flights connect in many different cities, a storm in one location could cause a ripple effect throughout the system, affecting flights all over the U.S. and beyond. It’s always best to reconfirm your flight before heading to the airport. Sign up for Alerts: Most airlines (and online travel agencies) offer alerts via email or text message, which can keep you informed of any changes to your itinerary. However, if a big storm is in the forecast, it’s always a good idea to be proactive and contact your airline directly rather than waiting for it to contact you. Pack Smartly: If do head to the airport, keep essential items—including medications, cell phones and chargers, a change of clothes, and toiletries—in your carry-on. You might not be able to access your checked baggage if you are stranded at the airport. It’s also a good idea to pack some food, since options might be limited. Try All Rebooking Avenues: If you need to rebook, there are a few things you can do: Wait in the customer service line (if at the airport), stay on the phone until you get through to an airline representative, get online and visit your airline’s website, or use social media (some airlines will respond to direct messages on Twitter). You may want to try multiple options simultaneously. Note: Always program the phone numbers of all your travel providers into your cell phone before you depart for the airport. Contact Other Travel Sites: Since wait times can be extensive, try contacting third-party providers, such as the online travel agency you used to book your reservation. Contact All Other Travel Providers: People often focus so much on their canceled flight that they forget their hotel, car, and other reservations will also be affected. Reach out to other travel providers as soon as possible. Many will bend policies in worst-case scenarios, allowing you to rebook or get a full or partial refund. Get a Cash Refund: If your flight is canceled and you decide not to rebook within the waiver time frame, try to get a cash refund, as credits and vouchers for a later date might be hard to use due to hefty restrictions. If you purchased trip cancellation insurance (TCI), check your policy to see what kind of reimbursement you can get. Look for a Hotel: If you wind up stranded, get online and look for hotels with last-minute availability. Or download a last-minute hotel booking app such as HotelTonight or Priceline’s Tonight-Only to your phone. Be Polite and Ask for Help: While you’re not entitled to receive things like food vouchers and other perks, it doesn’t hurt to ask. Just remember to be polite and don’t make any demands. Airline agents will likely be stressed as well, and they will be more like to help you if you treat them with respect. 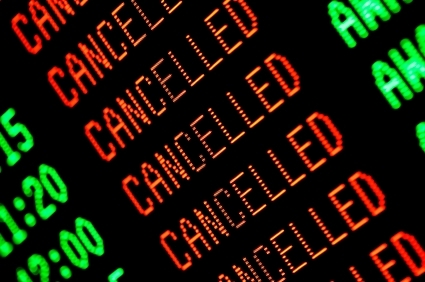 Have you suffered through a canceled flight during bad weather? How did you handle it? Should Travelers Be Compensated in Bad Weather?